So when I was at the comic-con this weekend, I discovered a local company that produces a board game called Galactic Empire. I haven’t had a chance to play it yet, so I can’t comment on the quality of gameplay. But I am put off a little by the visuals of the game, so I thought I’d try an exercise to see what I would change. 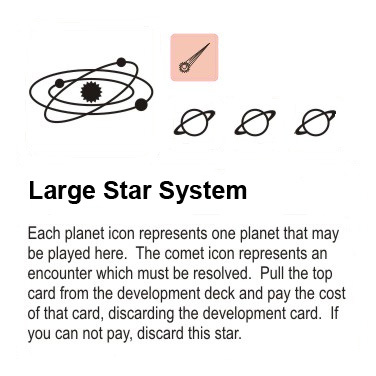 First of all, it’s a space-themed game, and rather than create a bunch of illustrations against starry backgrounds, they use basic iconic graphics. That’s an odd choice, and probably the cheaper choice, but I won’t contradict that. The first thing that jumps out at me is all the borders. Are they really necessary? In Edward Tufte’s book The Visual Display of Quantitative Information he brings up the idea of a data ink ratio. It’s basically a way to make you brutally evaluate each element of your data graphic and eliminate all those that don’t provide any data. Those borders around the text don’t provide any data about the nature of the card, so they should all be erased. I would even erase the ones around the icons. You might try to argue that they help you know which icons line up with which, but it’s a 3×2 grid, there’s not enough distance between any two icons to get confused. Second of all, I’d move the title of the card to be left-justified, rather than centred. You could still use a centred title if you made the body text fully-justified. I’ll bet the card’s creator also felt something was wrong with combining a centred title with ragged body text, and those borders I erased were added in a misguided attempt to address that. And having the title text be the same weight as the body text is weak. I’d make the title text bold, maybe even black. It’s still just Arial, so it doesn’t require any new font sets. I’m not really a graphic designer, so I made only simple changes, but every change I made is a small improvement. And you’ll spend an hour staring at these cards each time you play the game, so small improvements still have a chance to make a big difference to your experience with the game. 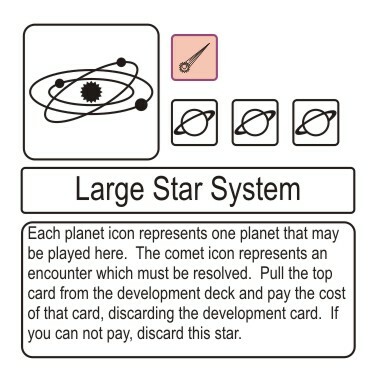 This entry was posted in uncategorized and tagged board games, game design, games, graphic design. Bookmark the permalink.